Kerala flood less intense than deluge of 1924, so why was damage as great? 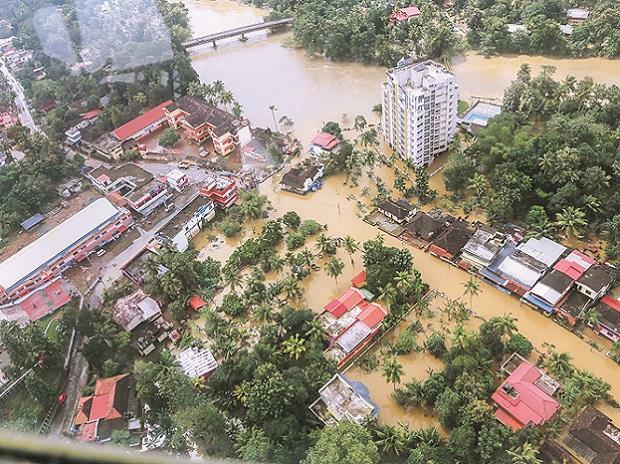 The Kerala floods will have an adverse impact on microlenders, general insurers, gold financiers and banks like Federal Bank and The South Indian Bank, a report said on Thursday. However, on the positive side, a spurt in credit demand and increased remittances will help the financial institutions, rating agency India Ratings said in its report. "The Kerala floods could materially affect the unsecured lending (microfinance institutions), SME businesses and the state's agriculture output, resulting in higher loan slippages and insurance claims," it said. The agency, however, said that even though loan delinquencies will shoot up due to the floods that have claimed over 470 lives, the actual haircuts which the financiers will have to take will differ from asset to asset. It said apart from the MFIs, two-wheeler and consumer durables financiers will have to take severe haircuts, while the pain will be a bit lesser for agri loans, motor insurance and loans against property. Among all the lenders, it specifically pointed out that Federal Bank and The South Indian Bank may witness a 25 per cent rise in non-performing assets immediately, but added that both have sufficient profits and capital buffers to take care of the strain. The agency, however, warned that any forbearance as provided under the RBI's guidelines for natural calamity would delay the recognition of the delinquency, which may increase the ultimate credit costs for banks and non-bank lenders. There can be an increase of up to 1.5 times in credit demand as the state seeks to come out of the crisis, but credit will be available to better-rated borrowers alone, it said. Gold financiers could see higher auctioning post-moratorium as their borrowers largely depend on agricultural activities for servicing loans, it said, adding that high-value gold loans will actually grow because of the floods. Microlenders had a Rs 21 billion exposure to the state with 2.7 per cent of them unpaid for over 30 days, it said, adding that there can be a "spike" in non-repayment because of the floods. "Microfinance players would face a higher impact and we will decide on any rating action based on the expected impact on profitability and capital buffers," the note said. For the general insurance companies, the agency said there can be a claim impact of over Rs 1 billion, but the actual impact on the industry will be minimal as most of it will be covered through reinsurance and catastrophe covers. "This would also lead to incremental higher growth for many general insurance companies post normalisation where the need for a cover against future catastrophes would increase with personal awareness," it said.